It's great progress indeed Ken, and a very nice board. And an interesting idea to be able to use micropython on the ARM to do assembly. We've mentioned the MCPU in an earlier thread on Minimal Instruction Set CPUs. 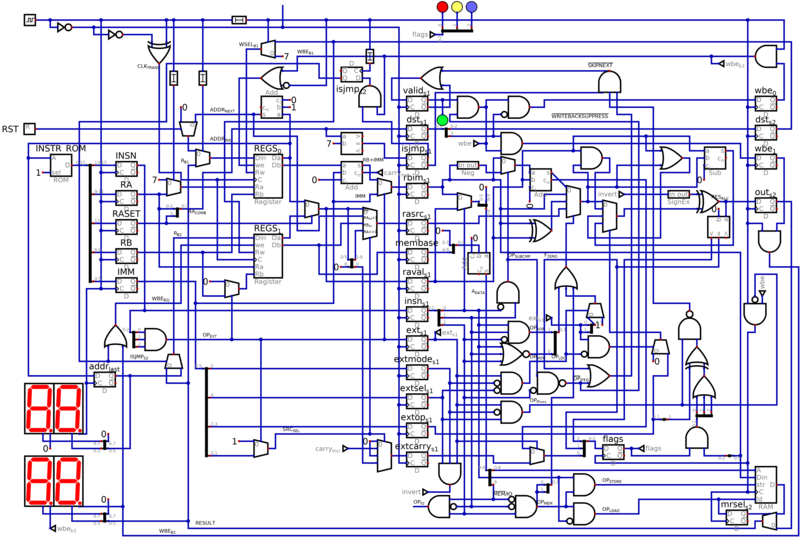 A 6-bit CPU (designed to be implemented in mostly TTL but using a pair of GAL16V8s for the ALU), with a schematic that fits on a single A4 sheet (at readable size), and ISA description that likewise fits a single sheet of paper (<66 lines, 80 cols). * two stage pipeline: every instruction writes results back immediately after the next instruction reads its operands. no detection of pipeline hazards, so programmer has to determine which registers are safe to use on each instruction! * 16 registers in two separate banks (R0-R7, R8-R15) in order to allow two registers to change in a single instruction as long as they are in opposite banks. * R15 is a subroutine link register; whenever R7 is explicitly modified, the old value is copied to R15, thus allowing a simple move to be used to perform call and return operations without needing specific instructions, either. * ALU designed to be implemented using a pair of 3-bit slices in GAL16V8 chips. Operations: add, subtract, xor, negate. * Schematic mostly shows direct connections between components, however a handful of signals are connected via "tunnel" components, i.e. the connections are labelled rather than drawn. I think there are less than 5 of these, other than this the connection paths shown are the connections needed. Haven't tested the design in hardware, but using 74S* chips for the critical path my estimate is that it should be possible to achieve ~10MHz. Interesting - thanks for sharing! Do I take it you have an assembler, or did you hand-assemble? Harvard should be an interesting simplification though: more busses but each is single purpose. There must be some 6-bit wide busses, but they are not easy to pick out - do you have any way to highlight them or draw them with a different style? Using Harvard architecture definitely simplified things. I originally chose it in order to avoid needing to fetch 3 words per instruction (as 12 bits wasn't quite enough to fit in enough information for the instructions I wanted), but not needing to multiplex the instruction fetch with data memory accesses also made quite a big difference to how I could simplify the structure -- I now have a single memory bus per pipeline stage with no need to coordinate between the two stages. As to highlighting the buses, unfortunately Digital can't do that. Most of the connections between more complex subcircuits (e.g. latches, adders, etc) are buses. Also note anywhere there's a thick black bar -- those are splitters/combiners for joining buses and individual wires together. Ah, I see you've done something about the register ports by splitting into two banks - is that right? Yes. Two banks of registers so I can write back to two registers simultaneously. * Along the top edge is clock distribution. I derive three separate clock lines from a standard clock input -- the input as is is used for pipeline stage 1, inverted for stage 2, and I detect transitions (by XORing the two phases) so that the registers (which update on positive edge only) can write back in both phases. * On the left is the instruction ROM and a set of latches for breaking the incoming instruction into fields, which are latched on positive edge of the clock. The instruction pointer is incremented (through the adder just above the register banks) on the same edge. * Beneath the register banks is the first stage of instruction decoding: if the opcode is 0x7, then an extended instruction is included instead of the immediate value, and two bits of that instruction are used to select a multiplexer input for the 'a' operand. If the opcode isn't 0x7, the multiplexer input is forced to zero, which selects the register chosen by the 'ra' instruction field. Other choices are: the same register plus one (only available for registers from the top bank) the register from the 'rb' instruction field selected from the bottom bank, or the 'ra' register value shifted right one place. * At the same time, the 'rb' register value is selected from the top bank and added to the immediate value. * A comparator connected to the destination register bus detects jump instructions and sets an output flag so they're easier to deal with in the next stage. * To the right of all this is a bank of latches for the output from stage 1 which trigger on negative edge of the clock. * Right of the latches at the bottom of the page is the remainder of instruction decoding, extending as far right as the flags latch (the multiplexer above and slightly to the right is decode logic too). This produces signals that drive selecting the correct inputs to the ALU, selecting the ALU mode, determining if the instruction needs to be written back to registers, or if it should cancel the next instruction (which happens if it is a conditional instruction whose condition fails, or if it is a jump). * An adder located adjacent to the 'membase' latch calculates memory addresses (a multiplexer directly above it determines the input). * RAM access is at the bottom right. * Above and to the right of the memory address calculator is the ALU. * The ALU output is fed through a multiplexer (which also takes as input AND and OR functions of the operands, which aren't calculated in the ALU itself, and the result of memory reads) and then through an optional negation before flags are extracted and the result latched for writing back to the appropriate register. * Above the ALU is logic for determining whether this instruction and the next instruction are to be considered valid, or if writeback is to be disabled for them (easily identifiable by the green LED which is set to show if the current instruction will be written back or not). * On the right hand edge the results of stage 2 are latched for writing back to the appropriate register. * Writeback is controlled by logic at the top edge of the page, just to the left of the stage 1-to-2 latches. This is really neat! Having a blast making my way through the submitted designs. Is a schematic of the OPC available (specifically OPC-6)? Digging through the code, but a schematic would speed things up. Reading the python emulator in parallel with the HDL might be helpful, although it is again written for compactness. There is also a C model which is rather more readable, but again it's modelling function rather than structure. Skipping between the three models to build understanding might be worthwhile. Last edited by BigEd on Wed Sep 19, 2018 9:49 am, edited 1 time in total. I jumped straight to OPC-6 because it had the most features I wish to learn about. But your advice to start from the first one is a much saner approach. 1) What does the predicate wire represent? 2) Why use the carry and result registers? Why not just use the C_q and result_q registers? 3) Why is a separate register PC_q used for the program counter value instead of registerFile[ 15 ]? Ditto for R0. Why is combinatorial logic used to zero the output instead of reading a value of zero from registerFile? 1/ Predication is the idea that every instruction is conditional. So we compute the condition accordingly, and then when it comes time to execute, we choose whether to execute or nop. 2/ I think you're seeing the pipelining here. Or at least, the careful management of clock boundaries. A flop has a D input and a Q output, so the convention in this code is to have 'signalname' be the combinatorially computed value which goes into the flops, and 'signalname_q' or similar as the sequentially delayed value which comes out of the flop. 3/ I think the idea here is to ensure we need only a simple single-ported register file. If PC and R were identical, we'd need two ports (at least for some instruction). For R0, we could either arrange never to write to it, or arrange always to write zero, or arrange never to read it. Looks like the third way was taken.